Just to prove that it does happen, there has recently been a couple of ties on eBay which are identical to the ones worn by the Tenth Doctor! Last month a Giorgio Armani Tie (Tie Seven, in my Tie Index) came up (see above). Based in San Francisco in the US, it had a $4.99 starting price, and ultimately sold for $144.50. You are bidding on a beautiful Giorgio Armani (white label) necktie. Although pre-owned I am very confident in saying that it is in near mint condition without even the most minimal of fraying at the tips. It has been worn 2-3 times maximum and treated with the utmost care in a smoke-free home. The base color is rich chocolate brown with blue undertones; pattern is brown circles with blue squares inside. 100% silk of course. As I need to make room for new purchases, my wardrobe clearance is your chance to win this and other items at a fraction of their original cost. 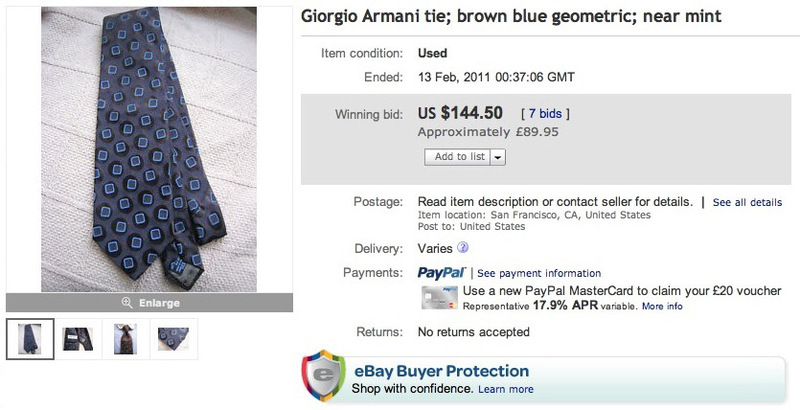 New Giorgio Armani ties now retail $145 on average, however I will start the bidding on this item at a low $4.99.